I was searching for a piece of audio today for a short video that I am putting together. While I can think of a number of popular pieces of music which would suit my need, I would be breaching copyright by simply using it directly in my video. Especially since I want to eventually share my video with others at my institution and probably openly on the internet as well. Fortunately, there is a growing pool of audio now available on the internet free for use under Creative Commons licenses. Scanning some of the audio resources available under open licenses produced positively interesting results! I was easily able to find something appropriate for my work and integrate it into my project. There were countless other potential useful audio clips ranging from individual sounds, riffs and loops and full songs! Here are a couple of the sites I reviewed to find freely available openly licensed audio. 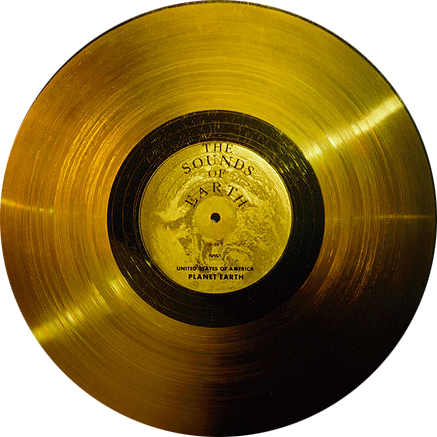 The Free Music Archive is described as an archive of public domain and Creative Commons licensed songs managed with a curatorial approach. The bulk of the audio available here is in the form of full songs from artists around the world. 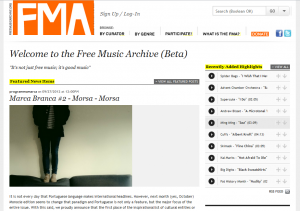 The Free Music Archive gives up and coming artists a place to share their bio and link to their home page so that users can learn more about the music they discover. 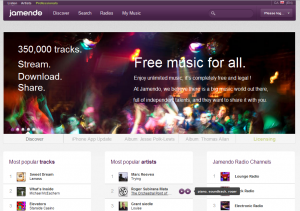 Like the Free Music Archive, Jamendo allows users to download and listen to songs and albums from up and coming artists. Even further, Jamendo has a series of radio channels available by genre which allows listeners to discover and share new artists. 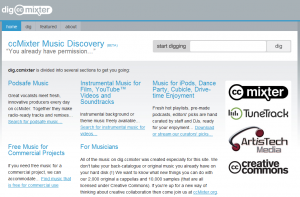 ccMixter is a community remix site sponsored by ArtisTech Media and created by Creative Commons. ccMixter offers a bit of everything including remixes, podcasts, samples and a-cappellas which can be used for remixing or in mixed media projects. 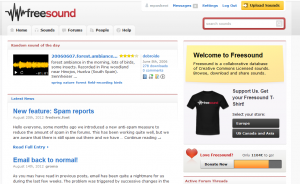 Freesound has less audio in full song format and more in the way of audio snippets, samples, recordings, bleeps and loops openly licensed for use. This is actually where I ended up finding the audio I needed for my project. There is a wide variety of audio available here from samples of nature and industry, to audio jingles and riffs. 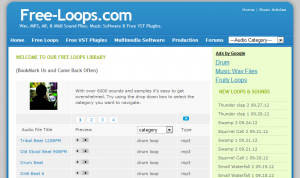 Free-loops much like Freesound is a collaborative database of audio snippets, samples and loops openly licensed for use. There is a wide array of audio available but most of the categories are built around instrumentation, so this could be a great resources for electronic musicians and audio programmers. Can’t reiterate enough that all of the music found via these sites is available for reuse under Creative Commons licenses! I find it exciting to think of all the possibilities of creative adaptation and combination of mixed media! Finding openly licensed audio and music by Michael Paskevicius is licensed under a Creative Commons Attribution 4.0 International License.